5.2 Increase shelf life of fruits and veggies! Who loves bad odor? I mean do you ever look forward to coming home and smelling the fetid whiff of the wind or the smell of a dead mammal or fart or mold? Read no further if you do, because the contents of this article would apparently be an affront to your queer delights. But if you crave the freshness of the winds just after the rainfall, are worried that the air you are breathing in might not be safe for consumption and are appalled by and find foul smelling air or bad odors in general to be a turn-off, then read on my friend, read on. If you're like me and live in a coastal region with bad government policies, you will quickly notice the fetid smell in the air due to pollution of the waters. If rodents ever infested your apartment and you applied poison, and now the mammals are dead and rotting, but for the life of you, you can't determine where the smell is coming from because you know the hassle. This is why ozone generators become much more important. Not to start another chemistry class, but ozone (O3) is an allotrope of oxygen (O2), notice the 2 in a regular molecule of oxygen is replaced with 3 in the ozone? Yes? No? Okay, moving on, Ozone is a strong oxidizing agent and one of the most powerful disinfectants known all over the world with 3000 times the germ-killing ability of Chlorine, capable of oxidizing smells and bacteria and rendering them odorless. In much more simplified terms, Ozone is that clean, fresh smell in the air after a thunderstorm and an ozone generator is simply a machine that generates ozone for the exclusive purpose of purifying the air and getting rid of unwanted odors. Many ozone generators also kill bacteria and fungus by oxidizing them. Also called VUV (vacuum ultraviolet) ozone generators, these generators work on loosely the same procedure the sun applies in producing the layer of ozone covering the earth, by using a light source to provide a narrow band UV light that converts oxygen on contact with it to ozone. While they are less expensive, the concentration of ozone they generate is on the small side. The Corona discharge ozone generator is the most common type of ozone generator. It employs the use of a corona discharge tube to generate ozone. The reason behind its popularity is due to its lack of reliance on oxygen as the source of ozone generation, but ambient air. However, fluctuations in ambient air due to environmental or weather conditions may affect its capacity to generate ozone. The EOG operates by splitting water molecules into atoms of hydrogen, oxygen, and ozone respectively. 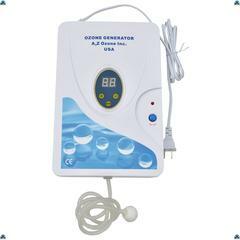 Because water is used as its source material, these class of ozone generators works independently of the air quality. This method is usually frowned upon because the production of ozone this way requires an over potential, i.e., more energy than normal. Here, pure oxygen gas is left exposed to plasma created by dielectric barrier discharge which splits the molecules of the oxygen into atomic oxygen. This atomic oxygen then recombines in threes to form molecules of ozone. Although they produce more ozone per given time than the UV generators, they are usually less common because the production of ozone this way is more expensive than the UV or the Corona discharge method. Depending on your purpose and your budget, the more the quality and quantity of ozone produced the better for you because there is a directly proportional relationship between the amount of ozone produced and the amount of fresh oxygen your lungs feel exposed to. Most ozone generators are capable of odor elimination but be sure before you purchase that ozone generator to check further that this feature doesn’t just come alone without mold control and removal, because what is the usefulness of an ozone generator if it is incapable of doing all this in one fell swoop. I am a sucker for low maintenance equipment because I believe strongly in the maxim that time should be spent on other more important things as much as possible. So instead of spending time maintaining equipment now and then, why not just purchase one that requires low human intervention when in use or after use? For industrial based ozone generators, portability is critical. Even for indoor and everyday household usage, simplicity is key. While an ozone generator is important, it shouldn't come at the expense of too much space in the living room, and it shouldn't prove too difficult to transport. The more, the merrier. Also look out for alternative deals in situations where you love a product, but the warranty isn't so much, do they provide cheap or free servicing or replacement of faulty parts? Or do they ship extra spare parts with your order – most especially ozone plates, as these usually stop generating ozone with continued usage and need to be replaced from time to time. Usually make sure your ozone plate has an hour rating of at least 5000 hours, meaning it can produce ozone for 5000 hours before a noticeable drop in its ozone generating capacity. NOTE: The smell of fresh ozone is very powerful and cough-inducing, so it is always customary to wait for 45 minutes for the raw ozone smell to dissipate after treating a room with an ozone generator. 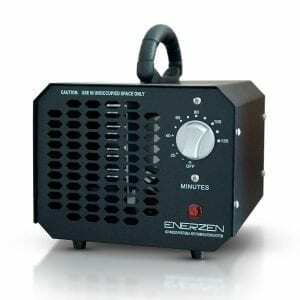 The Enerzen commercial ozone generator is a 6.8 x 8 x 5.8 inches ozone generator. 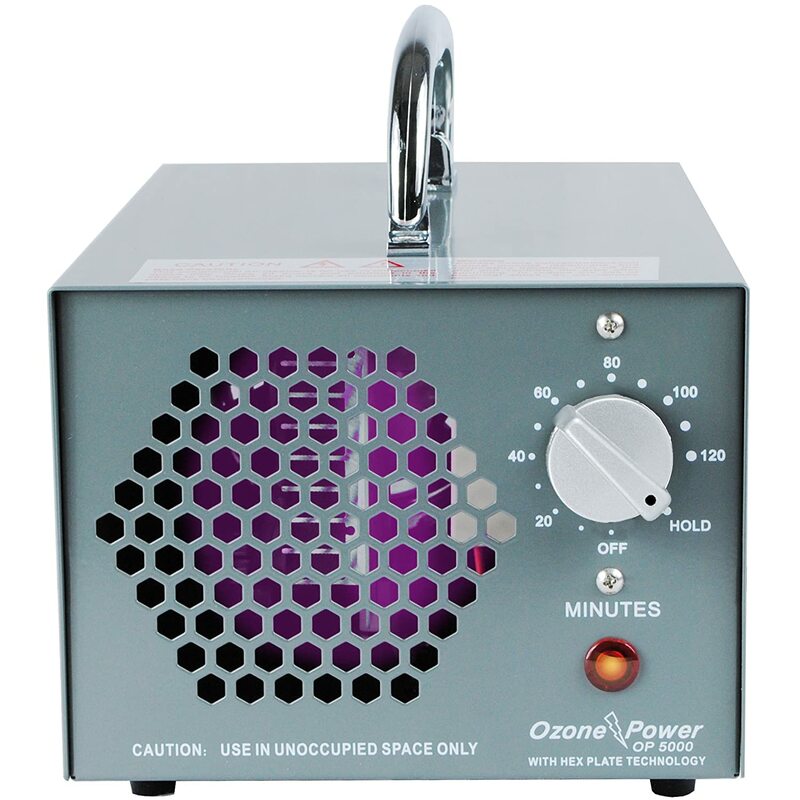 Weighing 5 pounds and shipping at 5.7 lbs, this ozone generator is one of the best ozone generators in the market. Although it advertises that it produces an average of 3500mg of ozone and a maximum production capacity of 4000mg, surprisingly, this unit has been shown to generate over 4100 – 4200 mg of ozone which is just amazing. This is a function of its super cool ozone plate. Coming new and improved, this portable and lightweight design unit comes with a larger fan which sterilizes more square foot for the same price we are used to paying and ensuring better ozone distribution. It is also extremely low to maintain since it works absent of an air filter. Its portable, light and compact nature mean it can be used almost anywhere, from your office, home, car, boat, just take it! 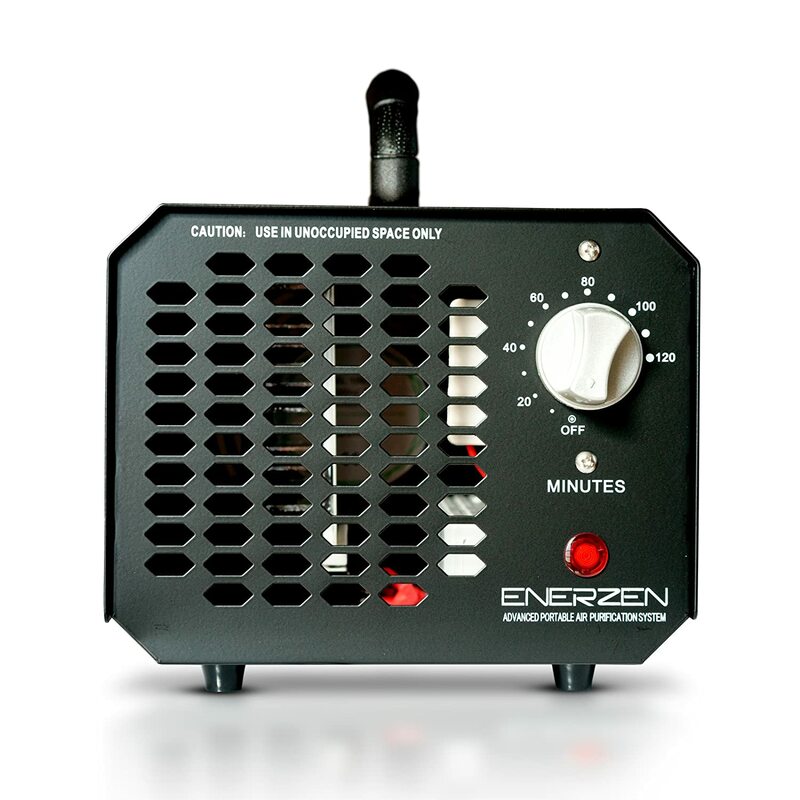 The Enerzen commercial ozone generator is also a powerful odor eliminator, mold controller, and removal, being capable of eliminating nearly any malodors from cigarette/cigar smoke, pets, mold, dust, smoke damage, water damage, paint/cleaning fumes, cooking odors, etc. It doesn't just eliminate them, but it retards fungus, mildew, and mold growth also. Many firefighters use the Enerzen OG. Lastly, its eco-friendly design is one we have come to love – as it makes this unit consume significantly lower energy than other units. They have a 30 days return policy where your ozone generator is either replaced with a brand new one, or you get cash refund if you are unsatisfied with their products. Regarding the quantity of ozone generation, its maximum output capacity of 4000mg isn’t the best as touted. For instance, the ozone power op5000 generates 5000mg, and it is also a commercial ozone generator much like the Enerzen. The size of the Enerzen ozone generator’s blades helps it produce more ozone per square meters than most of other industrial grade ozone generators. Apparently, the eco-friendly mode is only available in the USA 100v only model. The industrial steel casing makes this baby sturdy and more durable than your average run of the mill ozone generators. Also, its eco-friendly design is one we have come to love as it shows a responsible commitment on the part of the designers towards a better planet. Larger than the Enerzen ozone generator and standing at a dimension of 9 x 9 x 7 inches, the OP5000 is one of those ozone generators that rely on the Coronal discharge method for ozone generation to create ozone (see above under ‘Mode of Generation' for what the Corona discharge method is). A more simplified way to describe this method of ozone generation is to draw a parallel that in nature, the Corona discharge method is the way ozone is generated during thunderstorms by lightning strikes. Hence that cold fresh smell of the air after the rains as the Corona discharge method is nature's secret weapon for fighting odors and purifying the air. It weighs 5 pounds and ships at 6 lbs. and due to the significantly higher proportion of ozone capable of being generated (5000mg), this unit boasts of being designed to handle any odor and being capable of a 100% success rate in ridding your room or storage space of unwanted odors. It can be used in most places, as long as you have 110V power. Now one thing we didn’t like a lot is the advertised 5 YEAR EASY EXCHANGE WARRANTY. The shipping costs are prepaid, which means you pay for it, also most times you are required to send your old unit to them at a price which is much more expensive than the cost of a brand new unit of the OP5000, we found this to be very dubious. Higher ozone output generation of 5000 mg. Bad customer care services provided by the manufacturers when you call in demanding real assistance. Ozone generators of a much larger size have been known to produce less ozone than that generated by this unit; this is a testament to the design abilities of the manufacturers. While their five-year warranty may appear excellent, the bad customer care almost ensures that it’s hard to cash in on. Most of the times they would insist you send the defective product to Canada for a fee paid by you, a price which is much more expensive than the cost price of a unit of the OP 5000. Despite its seemingly larger dimensions, it still weighs the same weight of the Enerzen ozone generator, which means it’s portable for its size. It runs on the Corona discharge method. 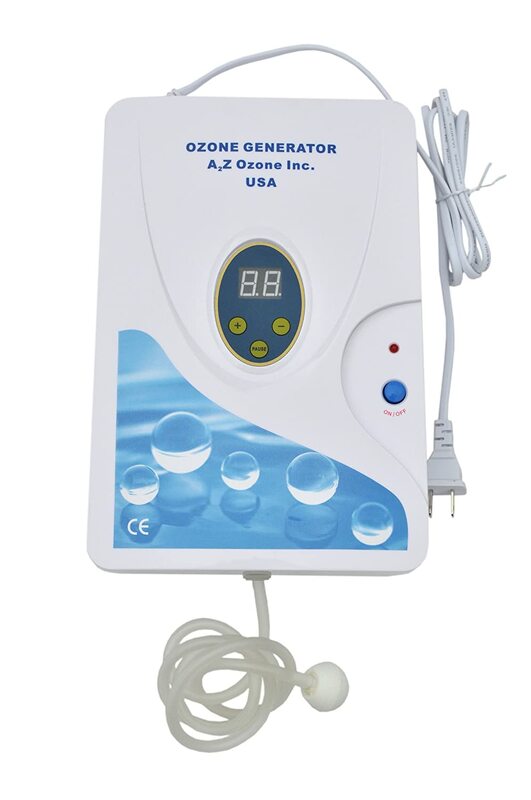 The A2Z Ozone aqua six multi-purpose ozone generator is another ozone generator that works using the Coronal discharge method. It comes beautifully designed and sleek in white and is made exclusively for home, and small scale supply of ozone and the manufacturers put a lot of thoughts into this particular usage of the generator. Hence it is light weight. Most of the things we loved about it arose from this particular function as was what we didn't like. Coming in at 11 x 3 x 8 inches and shipped at a weight of 3.1 pounds, the A2Z Ozone aqua six multi-purpose ozone generators is easy to install. It contains two 36' polyurethane tubes and two 1' diffuser bubblers so that it is essentially a plug and play type ozone generator. The above is the primary function of an ozone generator anyway. The controller has nine different repeat functions for as many times as you wish. Increase shelf life of fruits and veggies! The unit can also be used for rinsing and washing fresh fruits. Just fill your sink or bowl with water, drop the diffuser 2-4 minutes into the water and leave it to ozonate the water for some 10-15 minutes. Only place the fruits and vegetables into the water before or after ozonating the water, never during. Ozonating freshly cut flowers help them last longer. Some users of this unit even note new leaf growth on the stem of flowers that were ozonated. The unit can purify from a glass of water to a gallon just by using the Function setting #1 (2 minutes run time). The A2Z Ozone aqua six multi-purpose ozone generator is so beautiful and sleek in design. Despite not being an industrial ozone generator, we were still not quite pleased with the shelf life of this device as it stopped manufacturing ozone for most times usually after several months of continuous usage. The color. It comes white, unlike its industrial grade counterparts that are just a mainstream black or pale gray. The above is because the plates inside the Ozone aqua six multi-purpose ozone generator that manufacture ozone needs to be periodically recharged now and then for it to be of continuous use. This requires someone with the technical know how to handle it, and it is, at least for now, impossible to send it back to the manufacturers for recharge. It can be wall mounted. It is not very durable. It is very portable and very easy to install, whether on the wall, floor, kitchen countertop or table. It’s perfect for home or office use. 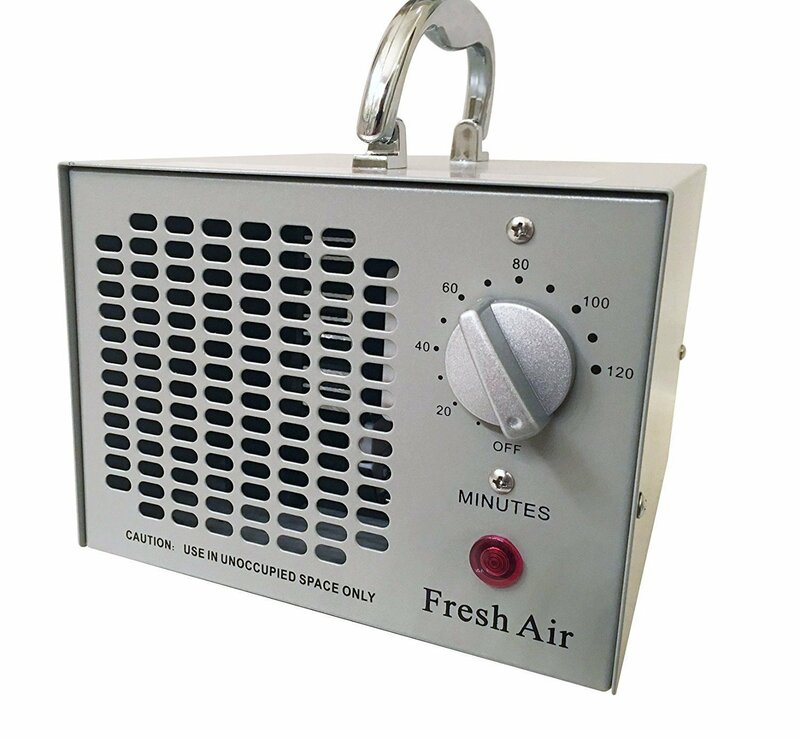 Coming from a dimension of 7 x 6 x 6.5 inches and weighing 5 pounds, the Fresh Air commercial air purifier ozone generator might appear moderately sized, but do not let its size fool you. This ozone generator manufactured by Breathe Fresh Air comes highly recommended as an ozone generator, mainly for its durability and its high concentration of ozone production. Capable of producing ozone at an average rate of 3500mg, this ozone generator deodorizes and eliminates almost most every bad odor you can think of, ranging from Cigarette/Cigar Smoke, Dust, Pet Odors, etc., you name it. It also destroys Airborne Bacteria/Viruses/Germs and removes Allergens such as Pollen grains from the air. This unit isn't just capable of masking odors; it can as well remove them from your air! The unit is accompanied by a timer that you can set, and then leave to return later after it has worked its magic. But be warned, for total deodorization, return 1 to 2 hours later after putting off the machine because while the unit is still turned ON and working, the air smells like chlorine/bleach in high concentrations, but this is just the air being scrubbed of bad odors, it is very normal. What you smell is the raw ozone in high concentrations. But if you return in an hour or two's time with the ozone concentration now lower, it smells like after a lighting storm. It is also low to maintain as it doesn’t contain any air filters needed to be cleaned. The unit is ‘plug and play,' as no special assembly is required, being ready to operate or run upon arrival. Its warranty is nothing to be exactly ecstatic about though as it comes with only a one-year warranty. The unit is capable of producing a huge supply of ozone. Hence you might think it is more of an odor remover than an air purifier, but that is not so, it does both. The pungent chlorine-like smell from this ozone generator takes a longer while to dissipate than it takes for other ozone generators. Although this is a testament to its capacity to provide raw, unadulterated ozone, we still found this to be a turn off; hence, it is not advisable to use the unit for occupied spaces. Low maintenance. Cheap warranty, just one year. 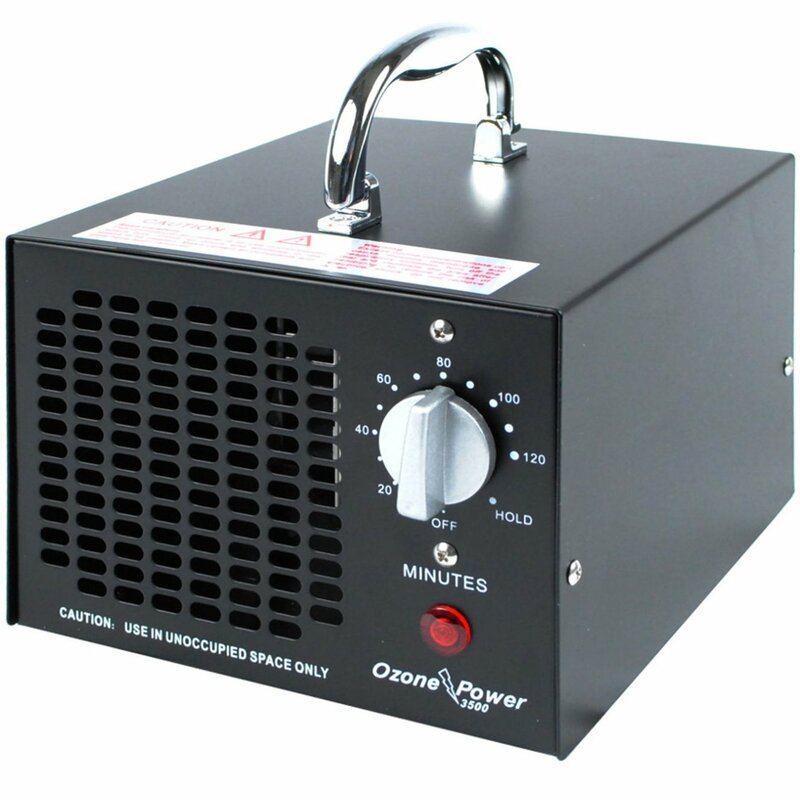 The Sylvan ozone generator is a large 12 x 9.8 x 9.5 inches ozone generator clocking 7.5 pounds. Before we go into all the details about this unit, one thing that thrilled us is the presence of a spare ozone plate. Ozone plates usually on the average work for about a cumulative period of 6000hrs. So with the above added additional plate, this unit is capable of generating ozone for an extended period of 12000hrs, before you ever need to replace the ozone plate. 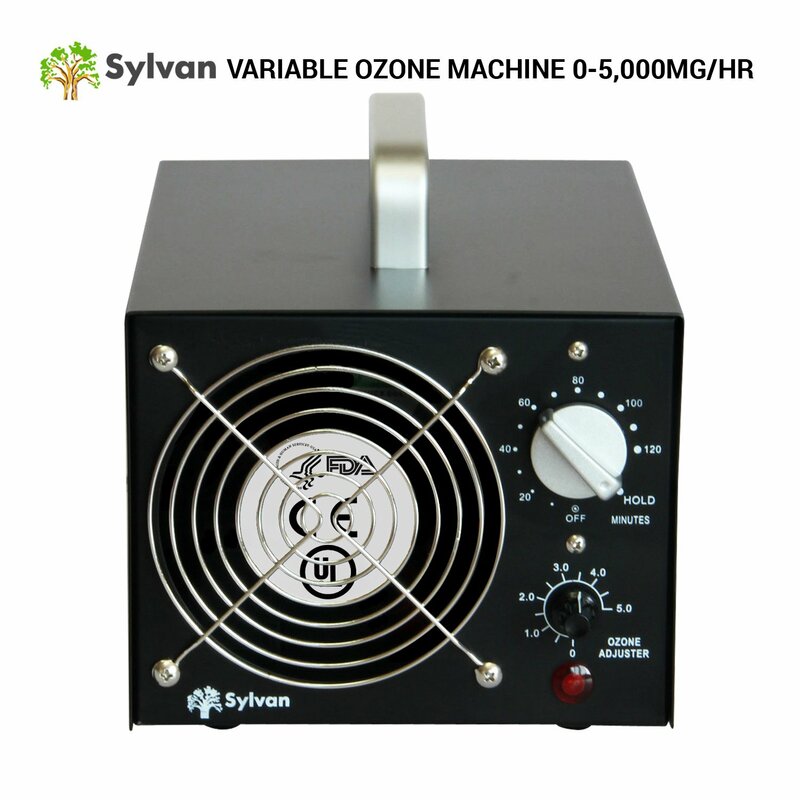 Producing 4000mg of ozone per hour when set at maximum, the Sylvan ozone generator comes equipped with a 0 - 120min timer and hold function that can be adjusted to temporary shock treatments or continuous air purification mode. This brand of ozone generators are also used by professional fire and water damage restoration specialists around the world, so it would mean it comes very highly recommended. It comes cased in a black powder coat aluminum case and has a maximum treatment area of 160,000 cubic feet. You know we are a stickler for freebies, so obviously, we were thrilled on the extra bit of Ozone plate that was delivered in our order, and this enables a longer period of ozone generation gotten from the unit. For the amount of ozone it produces, the large size was unnecessary. Compared to the Enerzen model that produces the same output but is 2.5 pounds lighter, we didn’t see the need for this. Professional endorsement by firefighters is a testament to the device’s ability. 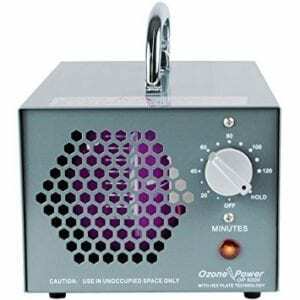 Coming from a dimension of 11 x 7.5 x 9 inches and weighing 12 pounds, the Fresh Air commercial air purifier ozone generator UV sterilizer 4000mg, as the name suggests is an ozone generator that generates ozone using the ultraviolet light method of ozone generation. This means that it relies on a light source to produce a narrow band UV light that converts oxygen on contact with it to ozone. It is also manufactured by Breathe Fresh Air and is quite durable. One amazing thing that thrilled us is their 30-day return policy, similar to those of the Enerzen; they accept a return of the product, no questions asked and replace it. It is unclear if they alternatively in a situation where the customer doesn't want a replacement refund the cash used in purchasing the item. Another thrilling thing about this product is the spare parts that come with it. We the Sylvan ozone generator comes with an extra ozone plate, this unit comes with a whopping 3 ozone plates, i.e., 2 extras, each with a 5000 hour rating – removable for easy replacement. What the 5000-hour rating means is that each plate can be used for a maximum time of 5000 hours before the consumer begins to notice a noticeable drop of ozone generated by the unit. When this ozone generator is combined with washing the fabrics of your car, your car would smell new again. It also aids in eliminating cigarette odor from the car. The unit comes with a timer you can set and come back after using it to work its magic. However, we must point out here that the Unit does not have a hold setting though the physical product says 'Hold' on it. The unit is capable of producing a huge supply of ozone. It is quite big on its size. It comes with a whopping three extra ozone plates, each with a 5000-hour rating. Weak warranty, just one year. The product has a ’30-day return’ policy, so make sure you try out your shipment for the first 30 days after it arrives to cure your doubts or make up your mind. The Foreverozone shock treatment ozone generator is a MONSTER!!! Considering that all the ozone generators we had used and reviewed up until now had a maximum ozone production output of 5000mg/h, I am totally in awe of this beast. You would expect this monster to be humongous in size, but it isn't, coming at a little 8 x 5 x 5 inches in dimensions and weighing just 5 pounds. So how then does it generate so much ozone you might wonder? 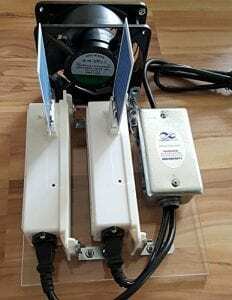 It does this by utilizing two solid state transformers mounted on 1/4" Plexiglas, provided with a sideways heat sink, fitted to these transformers to aid better cooling of the system while it is working tirelessly. It also comes inclusive of a three-outlet adapter and doesn't require the use of batteries and comes fully assembled without the plates which are easy to affix by self. For the permanent removal of heavy smoke smells. For the sanitation of air and the elimination of toxic biohazards such as viruses, bacteria, molds, pet feces, chemicals and other indoor air allergens. For the destruction of mites and parasites, including small insects whether flying or not. The Foreverozone treatment ozone generator can also be used for the removal of airborne and surface molds. This unit is an absolute monster. That should say enough right, but if it doesn’t, consider the fact that a 5 lbs. The ozone generator is capable of producing 20,000 mg/h of ozone and be in awe. Go ahead! They are not very durable. Its replaceable ozone plates are so easy to remove and replace. The reasonable pricing comes at the expense of a fancy case and fan, so it requires extra care and cooling to ensure the unit doesn’t overheat. It has a grounded power cord. The pricing is also very reasonable. This unit provides proper ozone of the usual average generation quantity of 3500 mg for anyone who seeks to eliminate smell and odors, smoke and mold in enclosed spaces of up to 4000 square feet. It also makes use of standard ceramic ozone plates which can last for 5000 hours of ozone generation. As always, these plates have to be changed when there is a noticeable drop in its ozone production capabilities. It also boasts of being very easy to use. Firstly, you insert the accompanying Plug of the unit into any 110v outlet and with the aid of the built-in timer, set the ozone generator to the desired treatment time. Cars usually require about 30 - 40 min, medium - large rooms 40 – one hour, basements an hour to two hours, entire houses about 2 hours. Note that while space or room is being treated, it needs to be left unoccupied because the concentration of Ozone is sure to make the air irritating to breathe during treatment. Then after the treatment time is over, wait for about 45 min to an hour for the Ozone inside the space or room to dissipate and breakdown into Oxygen. The number of treatment cycle space required depends on just how severe the odor of the space is. It is usually more efficient to run the unit in bursts/cycles than non-stop for extended periods of time (more than 4 hours at a time). Also worthy of note is that the Commercial ozone generator 3500mg also has an exclusive 'always-on' hold feature which allows it to run for more than 2 hours at a time, or to be paired with a wall outlet timer for automated use. Like other types of ozone generators, it works on mostly all odors and can be used in most places. It also comes with a decent five-year warranty, which we can all agree is better than for instance that provided with the Fresh Air commercial air purifier ozone generator (1 year). This is some breath of fresh air. It is very easy to use. The features are quite very average. Nothing makes this unit stand out in particular from the park. Even its weight is the average five pounds. It’s five-year warranty. Lack of an eco-friendly design. Its size is also portable. Didn’t have the decency to include an extra ozone plate. Because it is a very average item, a lot of its parts that need replacing can be easily replaced. For instance the ceramic ozone plate. Standing like a tower and with dimensions, 11 x 12 x 15 inches, the Della UV ozone generator weighs 15.4 pounds and is quite too large for the capacity of ozone it purportedly produces; just 3500 mg/h. Although the manufacturers claim that it produces up to 30 Percent more ozone than other brands, we did not see this, because the Enerzen in use produces more than 4000 mg/h, the Ozone power OP5000 produces over 5000mg/h. One unique feature to be proud of though is the Air Purifier mode which when in use enables this unit to function as a regular Air Purifier, purifying air for 24 hours, seven days a week, nonstop. Another thing we loved about this unit is the presence of washable filters which aid in odor removal, mold elimination, and bacteria destruction. These filters can be taken off and washed when they become over-clogged with dust and then reused as almost brand new. One thing that thrilled us when using the Derla UV ozone generator was that it has a variable functionality mode that allows you use it as a natural air purifier, capable of running for 24 hours nonstop seven days a week, to keep the air clean and fresh. For its humongous size, and weight, its ozone generation capability is quite average – just 3500 mg/h. We were quite taken with the tower-like design of this unit. Its washable filters were also quite endearing as this means that when the filters are clogged, they can be taken apart cleaned and reused. The above unit is Sylvan's reply to the OP5000. 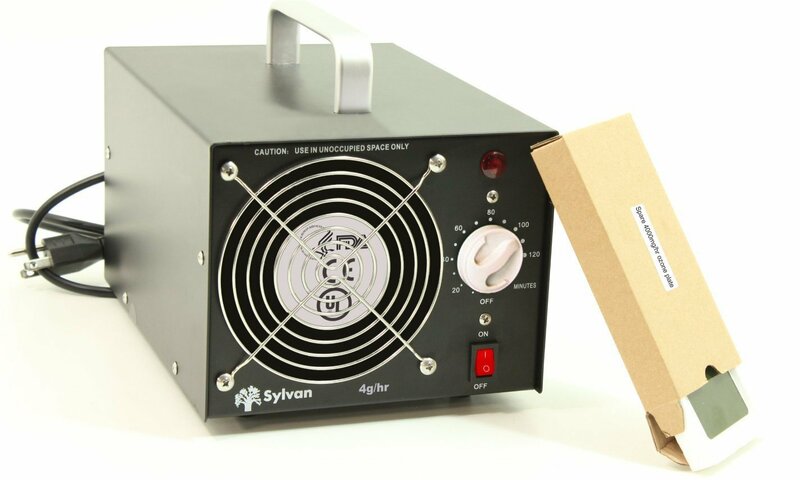 Standing at an impressive 13.1 x 10 x 9.4 inches and weighing just 8 pounds, the Sylvan variable ozone generator is capable of generating 5000mg/hr of ozone. But that's not all; the thing that endeared us to this unit is the presence of a variable ozone control. What this dial ensures is that a consumer can set the ozone output of this unit from a range of 0 - 5000mg/hr. Wait for a second, that's not all, as a result of this, you have an ozone generator that can be used as an air purifier in occupied spaces, even in small rooms without the noticeable strong chlorine-like smell of concentrated ozone and in the presence of pets and humans. Also with the timer that has a range of 0 to 2 hours and a ‘Hold’ function, you can set the ozone generator to temporary shock treatments or continuous air purification mode. Sylvan Brand Generators have been known to be used by professional fire and water damage restoration specialists, so it is safe to say you can trust their judgments on this. The capacity of ozone been generated by this product, was one of the best things about it, compared to the size, it is not a bad bargain. Insects have been known to get trapped in its intake port, and this is due to the absence of a filter. So what this unit needs is a filter for the intake port to prevent debris and insects from entering in and out the ozone plate. Excellent customer care by the Sylvan team as they are known to replace faulty parts with little or no cost to the consumer. Its adjustable dial which enables its function even in the presence of pets and humans. In conclusion, as humans, we owe it to ourselves to live as healthily as we can afford to and the ozone generator ensures that. It ensures that we breathe a better quality of air, free of noxious fumes and what not. Don't forget that making a decision on the type of ozone generator you want is a no-brainer if you follow our directions above. Don't forget that many companies offering seemingly good warranty might have roundabout ways to claim them; it is wise to avoid these people. But just to aid you in making your decisions, we have listed some items with special tag lines. BEST BUY – the ozone generator that will give you a good quality for your money. BEST HOME APPLIANCE – the ozone generator that can be used in all places in the house for varying multiple applications. BEST OUTPUT – the ozone generator that delivers the highest amount of ozone out of all the products reviewed. Lastly, we have the HONORABLE MENTION tag for the ozone generator we know also guaranteed to give you good value for your money but doesn't fall into any of the above categories. I hope this has been very helpful. In the meantime, enjoy breathing your whiff of pure, fresh, ozonized air. For more featured home items just click here.